Bovine Viral Diarrhoea Virus (BvDv) is a small enveloped RNA virus belonging to the genus Pestivirus. It was first discovered in New York in 1946 and today still continues to cause severe economic losses to the dairy and beef industries world wide. The main effects of this infectious agent are scouring, infertility, abortions, reduced growth and illness associated with immune-suppression. It is primarily an animal spread infection with the main source of the virus being a persistently infected (PI) animal. There are two types of BvDv infection; persistently infected (PI) and transiently infected (TI). A PI animal is created when their dam is infected with the virus during gestation, especially in the first trimester of pregnancy. PI animals continually shed the highly contagious virus from all secretions throughout its entire life. This is the main way BvDv is spread and perpetuated in a herd. A TI animal is usually infected by a PI animal. It sheds the virus for two to three weeks before developing immunity and recovering. The principal loss from BvDv relates to pregnancy loss. BvDv virus spreads by two methods (i) direct transmission between animals through physical contact and, (ii) virus invading the foetus in a pregnant cow. If a cow is infected from 1 to 4 months of pregnancy and the calf survives there is a strong chance that the calf will be born persistently infected (PI) with the virus (a carrier animal). Please see the AHI website for more information on the National Eradication Programme. No biological test is 100% accurate. 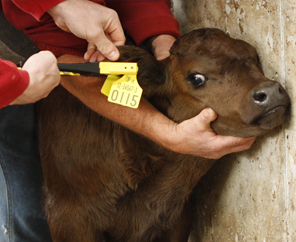 If an inaccurate result is suspected, the animal should be isolated and re-tested. All designated laboratories are independently accredited for BVD testing and the test methods used (ELISA or RT-PCR) will, in the great majority of cases, accurately detect the presence or absence of virus in tissue and blood samples when submitted and tested correctly. However, results relate only to the sample as received by the laboratory and, whilst laboratories warrant that their tests will meet their applicable declared specifications, the laboratories make no other warranty, expressed or implied and accept no responsibility or liability in respect of false results which are within the limits of the declared specifications of the tests offered. No representation or warranty is given by AHI, ICBF, the Technical Working Group, the Implementation Group or any member, employee or other person connected with any of the foregoing bodies as to the accuracy of any BVD test methods or test results. Neither AHI, ICBF, the Technical Working Group, the Implementation Group nor any member, employee or other person connected with any of the foregoing bodies shall have any liability or responsibility in respect of any laboratory or the accuracy of any test methods, test results or reports produced by any laboratory.